As the first physician in the Elgin area to offer Mohs surgery, Suleman Bangash, DO is a trusted expert among skin cancer patients. Dr. Bangash welcomes new and existing patients to the Mohs Surgery & Dermatology Center clinics in Elgin, and Crystal Lake, Illinois. After earning his bachelor’s degree from Northwestern University in Evanston, Illinois, Dr. Bangash completed his Doctor of Osteopathic Medicine degree at Kirksville College of Osteopathic Medicine in Missouri. He went on to finish his residency training at Lutheran General Hospital in New York City. To further his expertise and experience, Dr. Bangash completed a highly specialized Mohs micrographic surgery fellowship with the Dermatology Associates of Tallahassee in Florida. He’s board certified in both dermatology and Mohs micrographic surgery through the American Osteopathic Board of Dermatology. 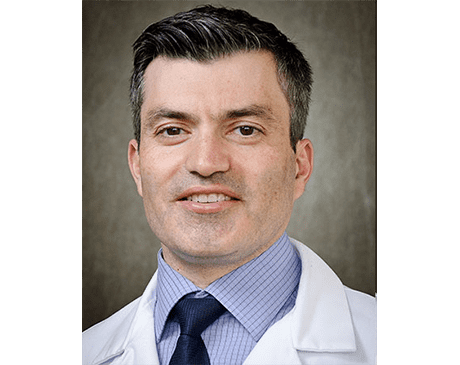 As a Mohs surgeon, Dr. Bangash is highly skilled in the surgical removal, pathologic interpretation, and reconstructive surgery of skin cancer. He’s also an expert in cutaneous oncology, which allows him to customize treatments and management solutions for high-risk skin cancer patients. Dr. Bangash maintains professional memberships with the American College of Mohs Surgery (ACMS), the American Academy of Dermatology (AAD), and the American Medical Association (AMA), among others. He regularly lectures and presents at national meetings of the ACMS and the AAD and has been published in several peer-reviewed journals.